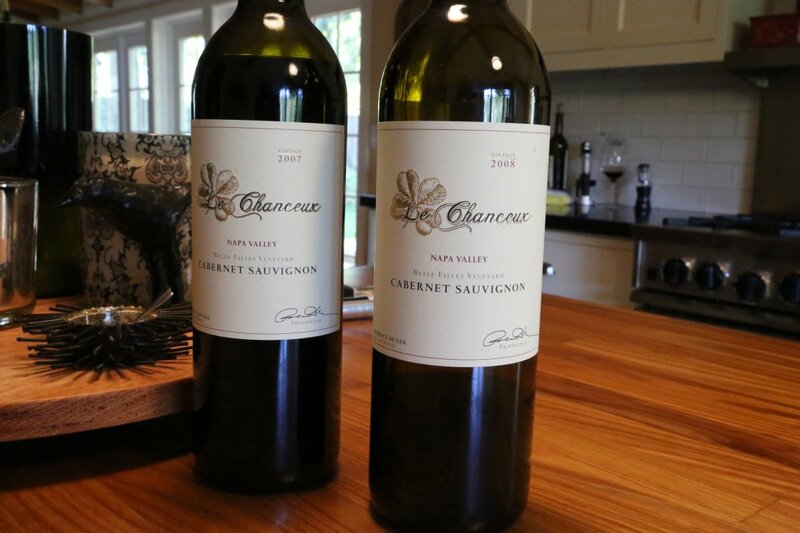 Le Chanceaux [pronounced luh shahn sue] Robert and Susan McNerney moved to the Napa Valley in 1989 – and ultimately moved to a small property in what is now the Coombsville appellation in 1999. The land was originally planted to plums, was a horse pasture for many years and had never been planted to vines. 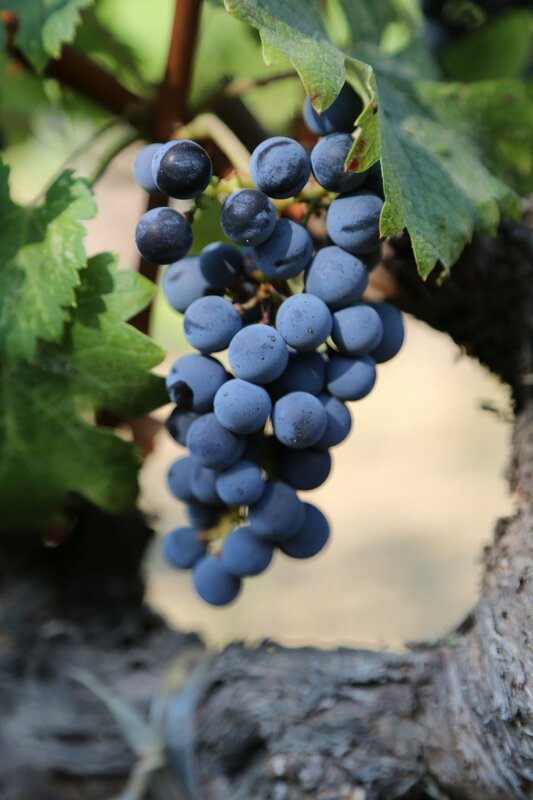 In 2002 they planted an acre of vines – all a French clone of Cabernet Sauvignon. Initially the intent was not to make wine but rather to sell their fruit to another winery – however in 2005 (because there was so much fruit on the market) they were unable to sell the grapes. In talking with good friend and mentor, Napa vintner Mike Elliott – they changed their mind; Mike soon helped them with the wine making and initial challenges of starting a new wine brand. Their first commercial release was from the 2006 vintage. Susan had little knowledge of viticulture prior to when they planted their vineyard. She enrolled at Napa Valley College and took some of their viticulture and oenology classes – taking several courses with Dr. Stephen Krebs (Dr. Krebs has been a mentor to many we have met with in Napa who either own vineyards or are making their own wine). When we met with Susan she had just come off a 60 hour work week in the vineyard. The vineyard work is “work” but at the same time it is not. The vineyard is small enough that she can manage it herself. And she is quick to note that her reward for her hard work certainly shows in the final product and also from the satisfaction she gets when other people enjoy her wine. Despite only managing one acre of vines – this is still approximately 2000 vines based on her row spacing – and depending on the time of year, there is always plenty of details to stay on top of among the vines. And even when there isn’t any work to do, the vines are never very far away; Susan can keep a close eye on her vineyard directly from her kitchen sink. Their plan was to create a premium wine together – both as a retirement project and also to help with their daughter’s college education. However Robert passed away in 2010; Susan did not make wine for several vintages. She then decided to move forward on her own – creating a business plan through the Small Business Development Center in Napa and learning as much as she could about growing grapes and the wine business. She relaunched the brand with the production of the 2012 vintage (to be released in late 2016) and brought the older vintages back to the market. Her own description of her efforts is very appropriate: “one acre, one woman, one wine”. Since relaunching, Susan has found a unique outlet for promoting her wines – charity events. These events have introduced her to potential customers, been helpful for networking with other vintners and her wines have been donated as charity items for raising money for causes ranging from supporting children to classical music. Her first big charity event was in 2012 at the Jackson Hole Wine Auction. She was by far the smallest vintner represented here. One of the sessions was “women in wine” – before this session began she pulled over a gentleman who was standing near her table. She had no idea of his stature in the wine community. At one point in there conversation he asked her if she knew who he was, (Susan did not) and he went on to tell her that he was presenting all the women in this event at this particular tasting. It turns out he was Matt Kraemer, long time columnist (since 1985) for the Wine Spectator. It also turned out that Matt really enjoyed her small production wines – introducing some of his friends to her brand and ultimately helping get her a placement in a restaurant. When a well respected wine writer takes interest in your wine – it certainly is not a bad way to get some additional exposure as a small vintner. Other recognition has been equally rewarding – Susan entered a vintage into the Finger Lakes International Wine Competition – her wine earned a double gold (only 42 of 1500 entries took this medal). When deciding on a name for their wine Susan referred back to a question she often posed to her children during their formative years. She would ask/remind them, “do you know how lucky you are to be living in the Napa Valley”? Turning to the Internet, her daughters searched for an appropriate term in French to describe someone as being lucky. Le Chanceaux translates to “the lucky ones” in French. And not only lucky, but also blessed. And the vineyard itself is a tribute to her daughters, in French it is named “Belles Filles” – which means “beautiful daughters”. There is a common thread through all the vintages of Le Chanceaux that we tried – these are well balanced wines, the bouquet of each wine is elegant with appealing fruit, the tannins are supple and polished and each wine shows very good acidity. The 2007 vintage reveals a pretty nose – with touches of earthy notes, red licorice and black fig aromas. Higher toned fruit from mid palate to the finish shows – plum and red raspberry. The tannins are well integrated, soft and linger smoothly with hints of mocha and a dusty component on the finish. 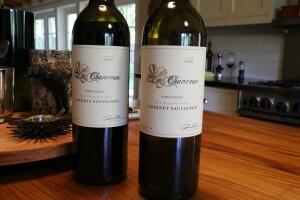 The 2008 vintage is again very elegant on the bouquet but perhaps more intense in aroma and flavor then the 2007 vintage. It shows a sweet aroma core of red fruit, nuances of raspberry liqueur and black currant – this is a bouquet that is intriguing, one can keep going back to it to pick out additional nuances of fruit as it opens. The wine has good density and good acidity. Fine grained tannins linger delicately. The 2009 vintage shows a bouquet different than the other vintages (this was the only vintage that did not have a percentage of new French Oak during the aging). The nose was a bit closed during our tasting and took some more time to open up compared to the other vintages. Notes of vanilla, a tobacco smoke and red cherry shows. On the palate there is plum and raspberry flavors – more high toned fruit rather than darker fruits. Of all the vintages this wine has the most obvious acidity – it is mouth watering especially on the finish which shows a nice tartness. Most of Susan’s tiny production (usually no more than 200 cases per year) is sold direct to consumer – via her website. However later in 2015 her wine including a one barrel amount of Sauvignon blanc (not estate grown) will be available at Silenus Vintners (a cooperative winery and tasting room just south of Yountville). Serious wine enthusiasts can reach out to Susan once her wines are available at Silenus for a personalized tasting. Website doesn’t seem to be working. Do you have contact details for them? Website works fine – just tested.